Who says small businesses aren't hiring? The following seven firms are looking for a few good employees. Sam Zaid, Jessica Scorpio and Elliot Kroo came up with the idea of Getaround while attending Silicon Valley's Singularity University, dedicated to exploring transformative technologies with the lofty goal of "positively impacting humanity." The trio decided to concentrate on creating intelligent transportation solutions. The resulting idea became Getaround Inc. Launched in May 2011 at Tech Crunch Disrupt, an industry "hack-a-thon" (like Project Runway for geeks), the idea won the $50,000 first prize. That was in addition to the $3.4 million already raised from angel investors. Getaround's website lets anyone rent their car to anyone else, by the hour, day or week. Owners sign up for free on the website. They list details and a photo of their car, and agree to install a "car kit," allowing keyless entry via smartphone. Renters must be over 19 and allow their driving record to be checked. But they don't need to own car insurance, as all Getaround drivers are covered by a $1 million policy. Rentals range from $7 per hour for a VW bug to $75 per hour for a Tesla Roadster. Renters pay for gas, and owners keep 60 percent of the rental fee. The founders are confident about the company's success, despite the economic downturn, said Zaid. "We are a good business to be in during a down economy since we can help people make a little more money, sharing their cars with neighbors." The company expects to generate $300,000 to $700,000 in sales in 2011 and to increase that to "single-digit millions" next year. 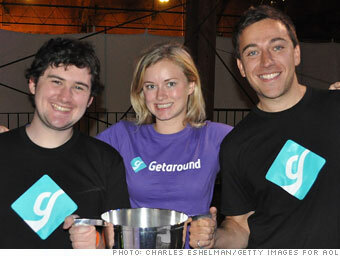 Getaround plans to add six to 10 more full-time employees before year's end. Benefits include catered lunches and free beer on Fridays. More hires are slated next year as the company expands from the Bay area only to West Coast cities. "We believe the age of hyper-consumerism is gone," said Zaid. "In the future we will use what we already have instead of new resources. It will be an environment of collaborative consumption."